Follow our top tips to help keep your water baby safe and happy. Consider your dog’s breed. Although some dogs are built for swimming, others aren’t. Labradors and Newfoundlands are renowned for their love of water, whereas those breeds with very short muzzles, large heads in proportion to their bodies, or short legs, can have a big disadvantage in the water. Never force your dog to swim — if he doesn’t want to participate, then you should respect his decision. If your dog is really enthusiastic and loves the water, be careful that he doesn’t overdo it. It may be wise to limit his time spent swimming, as some dogs just don’t know when to stop because they’re so excited. Bear in mind that, if your dog is older, he won’t have the same stamina levels that he did when he was young. If you don’t trust your dog’s recall, it’s probably wise not to let him swim in open waters, as he might block your voice out amid the excitement. Make sure your dog always has access to plenty of fresh water. 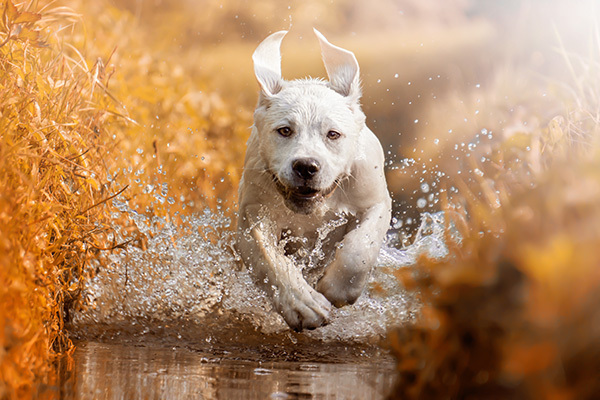 Canals, lakes, the sea, or puddles can be contaminated so it’s important to notice if your dog is just swimming and playing, or drinking the water as he paddles along. If he’s keen on drinking it, then it’s better to be safe than sorry and to remove him from the situation. Instead, let him have some fun in a plastic paddling pool with fresh water, or the garden hose/sprinkler at home. Add a bath mat to the bottom of the paddling pool to prevent slipping and float some of his favourite toys in it for added fun. Always keep an eye on your dog when he’s in the water. Sometimes dogs can get into difficulties in water (just like humans!) especially if the water is too rough or cold, the current is strong, or the dog becomes tired. If you’re planning on taking him on a boat trip, kit him out with a floatation/life jacket, which will help keep his head above water if he accidentally falls in or decides to jump overboard! After your dog finishes his swim, it’s important to dry him off, especially if it’s a cooler day, as even the lightest of breezes can give him a chill. Microfibre towels are lightweight and it’s worth keeping a stash of these in your car, or even investing in a drying coat, which he can wear on his journey home. When you get home, check his general health to make sure he’s not showing any signs of water intoxication (including staggering, vomiting, lethargy, weakness, glazed eyes, and drooling). Take him to the vet’s immediately if he is showing any of these signs.